Now, that's pretty impressive: completes Leicester on Sunday 26th October, flies to Dublin for Monday 27th? Might be worth a little digging to see if there are photos of his Leicester run. His splits say he ran 4:33 pace for 13 miles (6-19) in Leicester. That's sub-2h pace. Watch out, Kimetto! RE: Robert Young fakes run across America 6/23/2016 6:50PM - in reply to Impressive! Download the results from the link I provided. He's in there. Ignore me... I was looking at the 13km results. Did you see who finished 94th, just ahead of Rob? Good catch! Did not notice that. RE: Robert Young fakes run across America 6/23/2016 7:04PM - in reply to Impressive! That is fantastic, team1.klm. Just curious, does it make much difference if you separate out the time after the Geezers arrived? We know he was actually running after they arrived, so it seems that it would be interesting to compare (1) before 5/18, (2) between 5/18 and when the Geezers arrived, and (3) after the Geezers arrived (and maybe break each one down by day vs night). I wonder if the daytime pace distribution would be similar between (2) and (3), but the night-time distribution would change dramatically, with those fast miles disappearing. This would be consistent with night-time riding the RV coming to a stop when the Geezers arrive. In any case, those four histograms are amazing. ok, maybe tonight after I get home, or else tomorrow midday. I may need to reconcile the two data sources (12-minute vs 3-minute) but I think it should be ok. And probably fairly obvious when we see what it looks like! Thanks for the suggestion. Thinking a bit further, even just the 5 days before and 5 days after will likely be an eye opener.... More fun to come! Robbie finished 2 hours 22min and 1 second behind the winner. Go World Champion and World Record Holder!!! Keep turning up the heat. 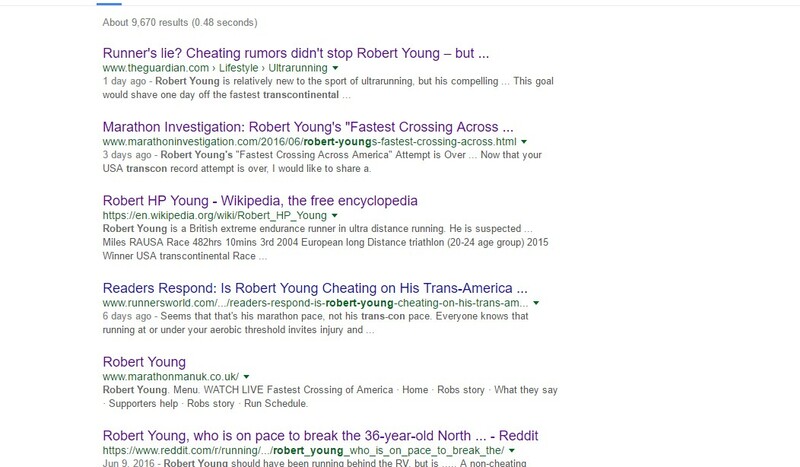 But for "robert young" transcon, this thread is only on page 2 of the search results. Come on Google! Just thinking... Has anybody been able to transcribe the handwritten logs RY showed in his video? They looked largely illegible but we could use those to identify witnesses who would have to have been complicit in the nighttime mileage logs. It's been awhile but didn't he say they had to be witnessed by two people? Who were the night driver(s)? Robbie averaged about 9:42 mile pace for 46.6 milesâ€¦for one raceâ€¦on one dayâ€¦on March 27, 2016. Is Robbie wearing SKINS in the photos? team1, this looks good but I think that you should use a percentage instead of count. So is it still true that it is not possible to alter and edit tomtom data? I just want to say - I was reflecting back on this whole incident, this thread, the skins blog, facebook, cloud-shared CCTV footage, archived web pages, etc, etc - God bless the internet. So cool it allows us to do all this stuff, and to bring down poor Robbie. Plus, so entertaining (though popping out of Mom's basement occasionally is good too). Good find, I guess that confirms he was in the army in July 05, but as for confirming champion athlete, I don't think so. Wonder why he got out.